The Beacon on Eilenach was the second out from Minas Tirith, but the summit of that mountain came to a sharp point, making the building of a bright beacon difficult. The next Beacon site to the west was not so hampered - it stood on the broad end of a ridge of the White Mountains, and the guard station maintained there could create a huge signal fire when needed. It was for this reason that the third Beacon acquired the name Nardol, 'fire-hilltop', because its beacon-fire was so bright it could be seen more than a hundred miles away. Dating any of the Beacons of Gondor is difficult, but that's especially true in Nardol's case. The beacons were constructed at two points in history. An original set of three was established sometime after III 2002 to communicate with Anórien after the loss of the Ithil-stone, and a further four were added to contact Rohan after its foundation in III 2510. The difficulty is in identifying the group to which Nardol belonged. 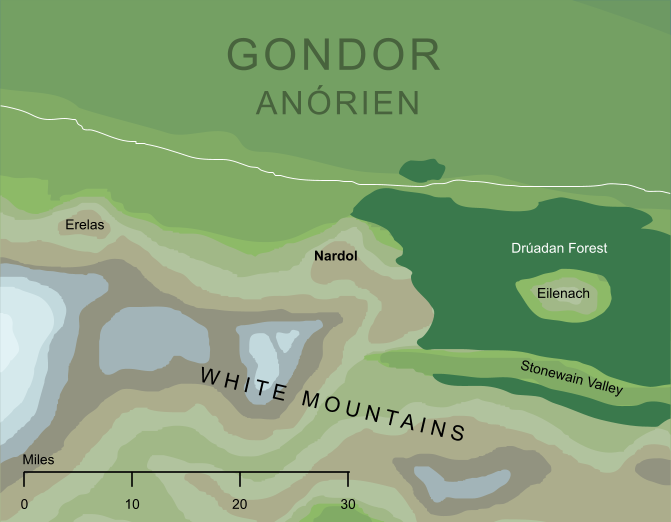 Nardol was the third beacon running westward from Minas Tirith, after Amon Dîn and Eilenach. It would seem logical, therefore, to assume to it belonged to the initial group of three beacons. However, the third of the original beacons is explicitly named (in notes reproduced in Unfinished Tales) as Min-Rimmon, the fifth beacon in the final system, far to the west of Nardol. The explanation for this slightly odd arrangement probably comes from the history of the text of The Lord of the Rings, during which Tolkien experimented with various arrangements of the seven beacons. The naming of Min-Rimmon as one of the original three might very well come from a period in which it was imagined as the third beacon rather than the fifth. If this is correct, then we can read Nardol for Min-Rimmon among the original three, and date it to about III 2002. If not, then Nardol belonged to the later group of beacons, and would have been constructed at some point after III 2510. The Elvish dol element literally means 'head', so formally Nardol means 'fire-head'. This dol element, however, was commonly used in the names of hills and mountains (as in Dolmed, Dol Baran, Mindolluin and so on), hence the more usual translation of 'fire-hilltop' given here.